A MAN decided to steal a car and "blow it up" 17 days after being released on parole for drug offences. Matthew James Ricardo, 27, pleaded guilty on Thursday in Rockhampton District Court to one count of arson, two of receiving tainted property, two of stealing and one of trespass. Crown prosecutor Megan Jones said Ricardo was with two female friends and one male friend on May 11, 2017, when he suggested they steal a car. Ms Jones said they broke into Hopkins Brothers on Alexandra St, found a Toyota HiLux with keys in it and stole it. "Ricardo later suggested they blow the vehicle up," she said. 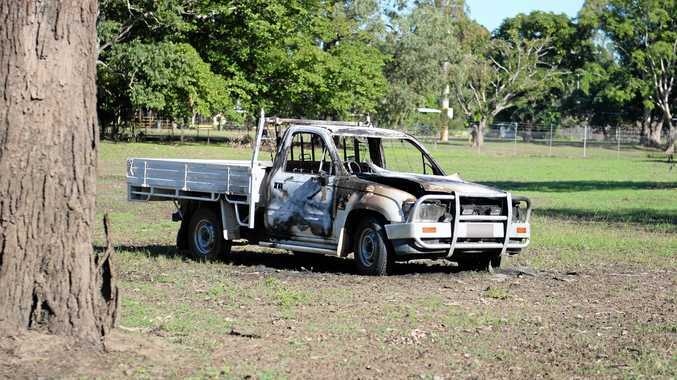 The court heard the ute was set alight by Ricardo in Goodsall St, Berserker, near Rockhampton Cricket Grounds. The vehicle was destroyed by the fire. Judge Michael Burnett commented that the others did not stop him. "It didn't take police a great deal of police work to work out who you were," Judge Burnett said. "You were identified on CCTV." The court heard Ricardo pointed the finger at a co-accused when police caught up with him. Ricardo was busted with stolen bicycles, accessories and $3500 cash on October 5, 2017. He also stole tools and other items from the back of vehicles. Ms Jones said a Dominos Pizza employee had their bike stolen while they were working in October 2017, and others were stolen from bicycle store Giant on Musgrave St.
She said police were led to Ricardo after they saw his girl-friend riding one of the stolen bikes, and they searched Ricardo's home. Defence barrister Jordan Ahlstrand said Ricardo started smoking marijuana recreationally when he was 20 years old and methamphetamine at 25. Ahlstrand said the former meatworks employee was high at the time of the arson act. Judge Burnett ordered Ricardo to a two year and six month jail term, declared 196 days presentence custody and gave him immediate release on parole.